For 15 days in June, foodies can get their fill of Sarasota affordably. Number one beach in the U.S. in 2012? Sure, I’m impressed by Sarasota’s legendary sugar sand. Other dishes I’ve tried and will never forget: salad “Caesaresque,” braised lamb shank, and Prince Edward mussels dish — at once rustic, elegant, smoky, and surprising in its broth of chorizo, garbanzos, and grilled tomato butter. It’s a stellar example of the standard of dining one finds throughout the Sarasota region – everything from home-cooked Amish to house-created ingenuity. Grouper sandwich a la Lazy Flamingo. With grouper fishing season just reopened as of April 1, the time is right to get it fresh at local restaurants. The iconic grouper sandwich is to Southwest Florida what hot dogs are to Coney Island. 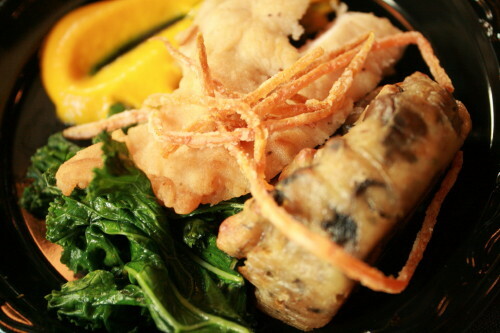 Nearly every local menu lists one, and each restaurant claims to make the best. “Best” may be in the mouth of the beholder. It depends upon if you go for the classic grouper sandwich — breaded and deep-fried to a golden brown then smeared with creamy tartar sauce – or something creative and lighter. With the onset of health consciousness, many restaurants offer the delicacy grilled, blackened, or broiled between a bun. It starts with one of the world’s meatiest, sweetest-tasting fish — a saltwater catch in the sea bass family that swims deep waters. The most common, red grouper, can grow to a beefy 32 inches and 25 pounds. So grab your appetite and let’s get started. Here, in no particular order, are 10 grouper sandwiches that I recommend wrapping your palate around. Lazy Flamingo, Bokeelia (239-283-5959) You’ll find Lazy Flamingo restaurants throughout the county, but I like Bokeelia’s best the best for its view of marina and boats. Seafood always tastes better seaside. 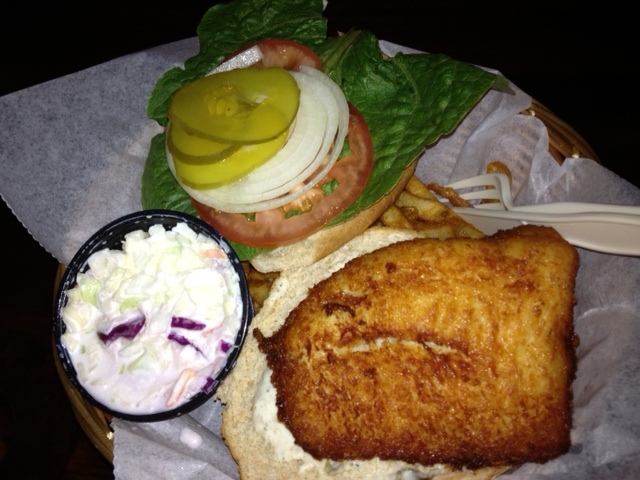 Its fried grouper sandwich is textbook classic with the exception of its overachieving caper tartar sauce. Lazy Flamingo adds the healthy touch of a whole wheat bun. Healthier still? Order the mesquite-grilled version and opt for Caesar salad instead of fries. 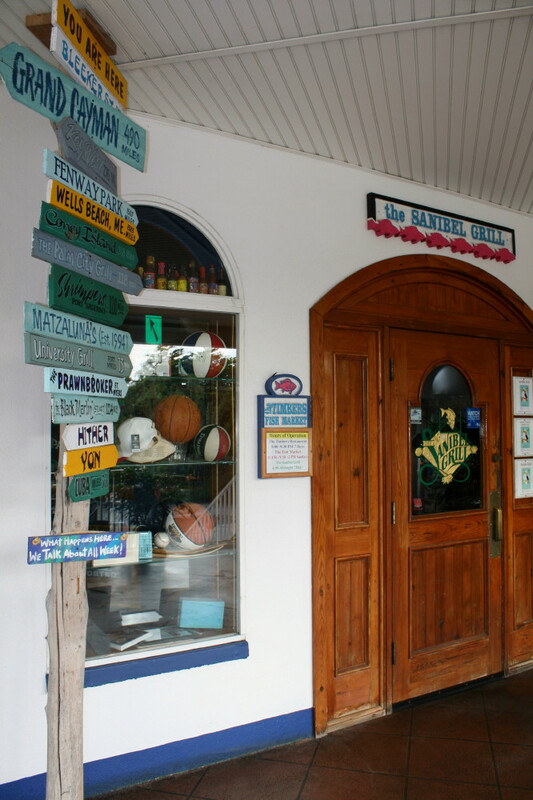 Gramma Dot’s Seaside Saloon, Sanibel Island (239-472-8138) Another salty marina view, another noteworthy tartar sauce: Dill sparks the mayo and sour cream, cornmeal forms the coating, and Swiss cheese tops it all off. You can also order the fish broiled, mesquite-grilled, or blackened. University Grill, Fort Myers (239-437-4377) Some restaurants add serious crunch to their fried sandwiches by rolling the grouper in cornflakes. The one they serve here could fairly break an ear drum. Rumrunner’s, Cape Coral (239-542-0200) Here’s another one that talks back at you when you bite it, with an outspoken crunch that counterpoints its chewy, soft Kaiser roll. Mucky Duck (239-472-3434) and Green Flash (239-472-3337), Captiva Island. Same owner, same recipe, different water views. The secret here to the cornflake-crusted grouper sandwich? Tartar sauce blended with house-made mayo. Coconut Jack’s Bonita Beach (239-676-7777) Crowd-pleasing Coconut Jack’s also coats its fried grouper with cornflakes, but gives diners options including beer-battered, blackened, and grilled. Diners often order the grilled version with the special homemade BBQ sauce; otherwise the sandwiches come with house remoulade on a brioche bun. Pincher’s Crab Shack (239-415-8973) Its Great Grouper Sandwich too gives you a choice of preparation: broiled, blackened, or lightly breaded. 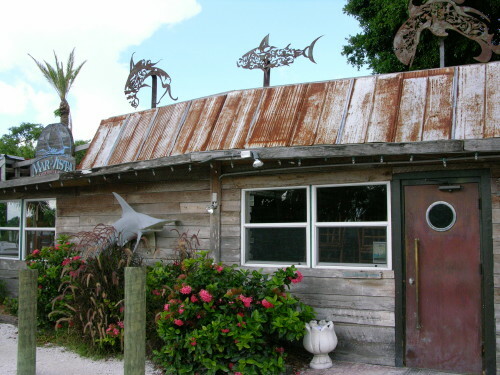 With several locations, its most properly fish-eating venue resides bayside at Fort Myers Beach. recipe. Here they grill the filet and serve it on a rustic roll. Sanibel Grill, Sanibel Island (239-472-4453) Cousin to University Grill, it too adds cornflake crunch to the grouper. Try it in the Grouper Reuben grilled with Swiss cheese and slaw. South Beach Bar & Grille, Boca Grande (941-964-0765) Its Ultimate Grouper Sandwich is the ultimate in gourmet – pan-seared and served with garlic butter glaze, oven-roasted tomatoes, and complex homemade tartar. It’s enough to make me lose my prejudice for classic fried grouper . So, if forced, I would deem it my favorite to date. However, I’m nowhere near finished researching the topic. My son and I are sushi fiends, but I wouldn’t necessarily qualify us as sushi connoisseurs. 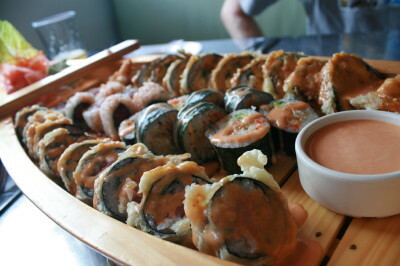 Not exactly purists, we are all about the Americanized sushi trend and creative rolls that the other place doesn’t do. I prefer my fish raw; Aaron goes in for cooked seafood and anything with cream cheese. That all said, here are some of our favorite finds in the south Fort Myers area. Osaka Japanese Steak House does teppanyaki, a full menu of Thai specialties, and a roundup of sushi, sashimi, and rolls. It moved from McGregor Boulevard to San Carlos Boulevard a few years ago, and now occupies a lovely Asian-inspired building with a soothing, welcoming interior. Stretching 12 miles between Anna Maria Island and Lido Key, Longboat Key is the only of the Sarasota-Bradenton coast islands with no direct access to mainland. That keeps it mired in old Florida on one hand, and floating on cloud luxury at the other. I experienced both extremes of its charmingly schizophrenic mood swings last week, staying at two different properties on two separate nights. LBK’s north end, which resides in Bradenton’s Manatee County, best reflects the island’s funky casual extreme. Exhibit A: Mar Vista Dockside Restaurant and Moore’s Stone Crab. The former has that lovely lived-in, borderline ramshackle look on the outside, crowned by an appropriately rusting tin roof. Inside, tables don’t match, napkins are paper, boaters hoist beers at the bar, and a view of the harbor dominates the decorator’s scheme. There’s also seating on plastic chairs on the patio, which has heaters when it’s cool and fans when it’s hot. The seafood is fresh, and the key lime pie is creamy, dreamy, and authentic. Locals still refer to this place as “The Pub,” its name in another century, but one that still comes first to the tongue. Moore’s, too, occupies a time-bubble of another generation in seafood dining. Next door to Mar Vista with an even more expansive bayview, it hasn’t changed its plain old cafeteria décor since it opened in the 1960s. With its own crabbing fleet, it dares to name itself after Florida’s favorite shellfish. Up the street, peacocks and peahens saunter and squawk. Along the gulf, the homes and resorts keep in the quirky, quiet theme. 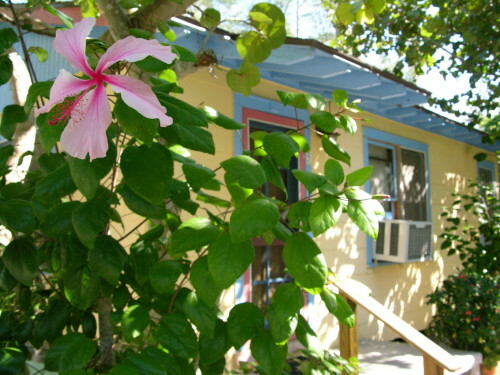 Exhibit B: Rolling Waves Cottages, my home for one night on the Gulf of Mexico. I’m never happier than when no shoes stand between me and the beach. The words “beach cottage” send goosebumps up my arms, and I’m not kidding. I’ve been making semi-annual stops at Rolling Waves for more than 15 years for my Sarasota, Sanibel Island & Naples guidebook. The owners kept inviting me to stay, and finally I took them up on it. Owner Kimberly had called me to let me know she wouldn’t be there to personally greet me, but that #6 (out of eight) would be open with the key inside. That’s exactly how casually things roll at Rolling Waves. Dating from the 1940s, the cottages have a retro exterior and a rustic interior, but with all the comforts of home. The wood floor in #6 squeaked in certain spots, and the walls could’ve benefited from paint touch-ups here and there. But on the other hand, it had colored sheets and towels instead of the typical hotel institutional white. The stove was gas-powered, and the gulf took maybe 30 steps to reach. Guest families homesteaded the beach with pop-up awnings. The kids could have been poster children for happy childhoods, I mused as I literally walked into the sunset. When I stopped to fill in a deep hole that dipped between a staked loggerhead sea turtle nest and the sea, some of my neighbors stopped to talk turtles as I explained that the hatchlings wouldn’t likely make it to the water with the hole en route. Or was it just my excuse to play in the sand? When I went into my cottage for the night, I slammed the screen door behind me. As they say, you’re never too old to have a happy childhood. Sunset the next night looked entirely different. At the south end of the island, in Sarasota County, things get higher and higher-end. Highest of all, the high-rise condos of Longboat Key Club and luxurious trappings of its resort make for a tidily manicured landscape and high-density man-scape. High-rises replace cottages at Longboat Key Club. How do I love this scene? Let me count the ways: 291 slips in the deep-water marina, 218 plush rooms and condo suites, 45 holes of golf, 25 Har-Tru tennis courts, nine miles of biking and walking pathways, seven restaurants, one organic spa, and zero toxic pesticides or herbicides used on the golf course. Did I mention seven restaurants? Unfortunately, 10 hours gave me opportunity to eat in only one, but a fino one it was, and at sunset a golden cast glazed the yacht marina that Portofino overlooks — quite a different harbor from Mar Vista’s. 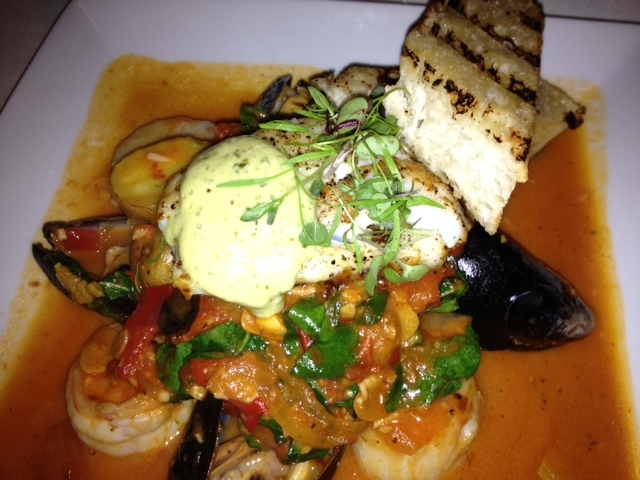 Decisions don’t come easily at Portofino. It’s known for its wood-oven pizzas. But how can you order pizza, pasta, and seafood all in one meal? So I passed on the pizza, but the ricotta spinach gnocchi with fresh fava beans and yellow tomato pomodoro sauce; and grilled wahoo with tomato panzanella salad were plenty to convince me that Portofino has a lot more going on than sterling views. Bottom line: You throw great food into the equation, and it’s going to sway me. Then there was the beach view from my fourth-story room and my sunrise stroll, where sand was the uncommon denominator of the two experiences. So, don’t make me pick a favorite between my two extremely different days, because both experiences are so LBK. So old Florida and new Florida wrapped up in one long ribbon of an island. Punta Gorda, Florida, dining capital? Suspend your disbelief and backburner your cynicism until you’ve pulled up a chair. Time was when it meant Karl Ehmer’s German restaurant, early bird dinners, and Fishermen’s Village. That all has changed.